Can’t you imagine this amazing kitchen in an adorable farmhouse out in the countryside? What a cool summer house this would be. I can imagine lemonade on the counter! 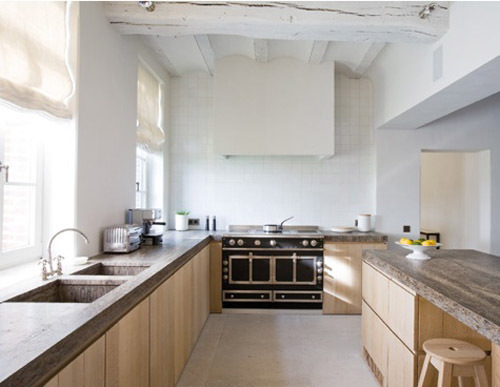 Gorgeous palate of white oak and warm stone countertops with a gorgeous vintage looking range. this looks so serene and summer along w. a glass of refreshing lemonade would fit the bill perfectly! Love the openness of it all… and I think I’m getting to like exposed beams… though with a more modern decorating aesthetic like this place. You’re right – a nice summer/holiday house. I like the picture and your blog! Oh I love the look and feel…vintage yet modern and open.